The Florida Gators baseball team has been a true Jekyll/Hyde story when comparing weekend games to midweek games. Florida has not lost a game in three weekend series going 9-0 including a three game sweep of rival Miami. 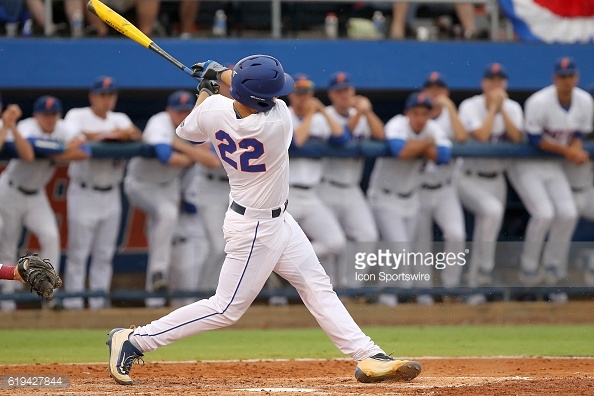 However, the Gators have struggled in midweek games going 1-4 with losses to Jacksonville, UCF, and two to FGCU. It’s been no secret that Florida has struggled to hit the ball this year. At times fans haven’t noticed because the pitching has more than made up for it. Other times such as last Sunday’s game against Columbia, fans were fooled into believing that the eight runs the Gators scored represented the bats coming alive. In fact, what really happened, was Florida was opportunistic. The Gators capitalized on walks and wild pitches that made the scoreboard look much more comfortable. Florida was expected to be a College World Series team based on their balance of pitching and hitting. The pitching has more than done their part with a team ERA of 2.68. Florida has only allowed 43 (34 earned) runs in 13 games. The hitting has lagged so far behind though. Florida’s hitters are hitting .259 so far this year. The fact is that Florida’s pitching trifecta on the weekend is so good, that the Gators can overcome their poor hitting. During the midweek series when Faedo, Singer, and Kowar aren’t pitching, the error margin is so small. Kevin O’Sullivan noticed this against UCF and was visibly upset at the team’s approach. In Florida’s back-to-back losses to FGCU, hitting again was the issue. Florida managed three runs in game one, but only four hits in game two (played at home). Maybe it’s time Florida sat JJ Schwarz for a game or two. Maybe it’s time to send a message and see how these players will react. Florida has only two (semi)regular players hitting over .300. Keenan Bell who has a .400 average in 25 at bats, and Blake Reese who is hitting .318 in 22 at bats. Florida needs to do something, otherwise a CWS appearance is not a given. Does anyone remember how last season ended? Florida could not hit the ball despite terrific pitching. Two losses on the first two days of the tournament. Just like that it was over. Florida must find answers and will need the likes of Schwarz to hit like he did as a freshman in 2015, not like he has to begin this year. (All statistics used in this article are accurate prior to Wednesday’s game against FGCU).